​Daphney and Cimmy had 7 babies born on 6/11/16. They are 4 boys and 3 girls. The boys are Raphael, Donatello, Leonardo, and Michelangelo. They are 2 seal lynx points, one seal and white bi-color and one cream lynx point. The girls are Dalhia, Iris and Lotus Blossom. They are 2 cream lynx points and one seal lynx point. 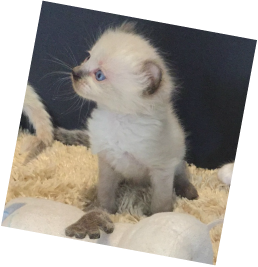 These babies are way too young to describe personalities yet, however they are starting to eat dry food and use the litter box. We will have more photos, and hopefully, a little personality descriptions to add in the next couple of weeks. Daphney is a super mom. This is her 2nd litter. We were so impressed with her 1st litter that we let her have a 2nd litter right away. We don't usually allow the girls to breed again right away, but Daphney is young and was a terrific mom. ​or the button at the bottom of this page. They are 2 seal lynx points and one cream lynx point. One of the 2 seal lynx point boys above. We grouped the boys together for these photos and then the girls together. The girls are 2 cream lynx points and one seal lynx point. They are Dahlia, the seal lynx point girl and Iris and Lotus Blossom, the 2 cream lynx points. Mike decided to bring Daphney's entire group in to the bedroom in this basket to expose them to a new environment. ​Donatello is curled up on the far left. The two seal boys are the 2 darker kitties. There's one little girl that has what I'm calling a "tonk look"... the body color is light but the points are a dominate dark. I have a couple individual photos of her... what a cutie. She's going to be absolutely STUNNING if this coloring continues to develop the way it is now. 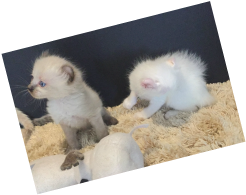 We have 2 other cream point girls, and one cream point boy. In the basket photos, the adult outside the basket in the back of the photos is our "nanny kitty", Breezie. Breeze LOVES the babies. As these kids ventured out of the basket, Breeze would capture one at a time by pinning the baby down in her front paws and start licking all over them. The kitty sitting outside the basket in the front of the photos is Maid Marian. I cropped several photos in this slide show. They were so curious about this new place, it was hard to get any one of them to stay still long enough to get a good face shot of them. In the first shot, I have one of the cream girls and the "tonk-look" girl. You'll see her in several shots. ​If any one of these kitties grabs your attention and you want more individual shots of any one kitty, let us know. We expanded their kitten cage to a double 8' long run with lots of platforms and things to climb on to strengthen their legs. They are having a ball. They are all eating solid food and using the litter box consistently... with mom still supplementing for dessert. Daphney's a great mom. She sits up on a platform and watches over the "play ground" as the babies romp. We go in to check on the babies every couple of hours, talking to them, doing a quick head count, and picking them up. These babies will be ready to go to their new homes the first part of September. For local pickups... that could be the end of August. Every one of these kids have been strong and healthy ever since they were born. They are active and involved with each other and with us. They are all going to be great additions to their new homes.